Murania Press » Join Us for a New Installment of the ART’S REVIEWS Podcast! Join Us for a New Installment of the ART’S REVIEWS Podcast! Those of you who have 39 minutes to spare could do worse than listen to the May 22 installment of the popular podcast Art’s Reviews, on which yours truly was interviewed by host Art Sippo. Our wide-ranging conversation touched on various subjects near and dear to the hearts of pulp-fiction fans. I talked at some length about the recent Windy City Pulp and Paperback Convention and plugged the upcoming PulpFest. We also discussed the current state of the pulp-collecting hobby. 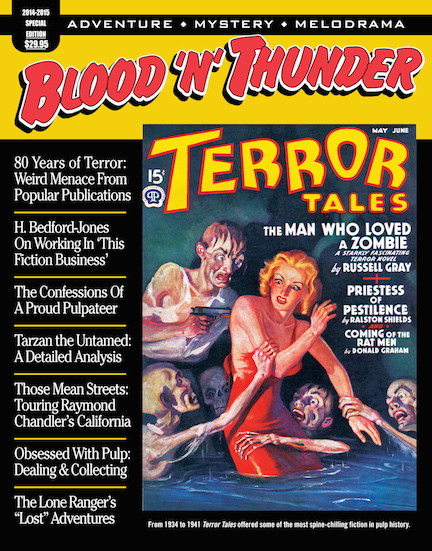 And, of course, I described in considerable detail the new triple-sized issue of Blood ‘n’ Thunder (which, by the way, bids fair to establish a new record for single-copy sales) and soon-to-be-released volumes in Murania’s Classic Pulp Reprints series. Art’s Reviews began last year as a continuation of the long-running Book Cave podcast started by Ric Croxton. For the last several years I’ve appeared on Cave ‘casts to promote PulpFest and Murania Press, and it’s always been a pleasurable experience. Art often joined Ric in conducting Book Cave interviews of writers, artists, publishers, collectors, and convention organizers, so he’s an old hand at the podcast game. You can listen to our most recent conversation here….